At some point, you may want to print out lessons or discussions from your classes. 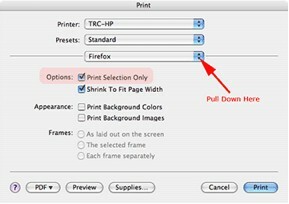 Below are printing instructions on specific platforms and browsers. If you have a 2-button mouse, right click in the middle of a discussion anywhere. A menu pops up. Pull down to This Frame… and over to Open Frame in a New Window. The frame opens in a new window without the header and left navigation menu. Choose File >> Print. If enabled by your instructors, you can click on the print button of Modules to print them. If they haven’t, you can use your browser’s print functions. Click and drag to select the information you want to print. Right click in the discussion you want to print. A menu pops up. 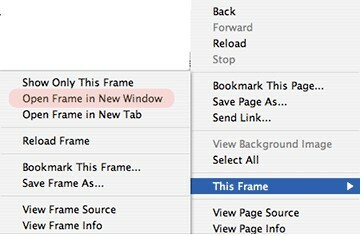 Pull down to This Frame… and over to Open Frame in a New Window. Choose File >> Print. Click OK in the resulting print dialog box. Right click in the middle of the discussion you want to print. A menu pops up. In the print dialog box that appears, click Print. Pull down to Select All. (Alternatively, you can select what you want to print by clicking and dragging yourself. Click and drag to select what you want to print. In the Page Range box (lower left), click Selection. Right-click inside the lecture you want to print. In the print dialog box, click on the Options tab at the top of the window. Click on the Only the Selected Frame radio button. If your instructors have set up tests to list all questions on one page, you may use the steps outlined for printing discussions to print a copy of a test.